The Federal Information Security Management Act (FISMA) of 2002 and the Federal Information Security Modernization Act (FISMA) of 2014 enforce stringent standards to ensure the security, confidentiality, and integrity of United States federal property and information. 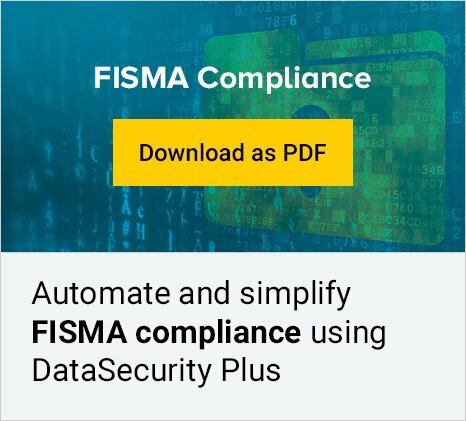 These acts mandate that all federal agencies, along with their contractors, service providers, and any organizations that operate government IT systems, follow certain policies, procedures, and processes to mitigate ever-growing data threats. DataSecurity Plus' audit tool helps you streamline your organization's network security, and detect and respond to potential threats, through continuous monitoring and reporting of all activities on your file server. You can use DataSecurity Plus' automated, actionable audit reports to achieve and maintain compliance with federal standards. Below is a list of reports you can use to prove that your organization is compliant. * You can also generate customized reports based on file path, users, business hours, etc. The Access Audit report provides detailed information on the quintessential Four W's—who accessed what, when, and from where. This will help you keep track of all accesses and changes. The Access Analysis report provides a summary view of accesses and changes, which can help you detect access trends. The File Analysis report helps isolate files that are old, unused, unmodified, large, hidden, or non-business; making data cleanup easier. The Disk Analysis report provides visual insight into disk space usage and trends, facilitating optimization of disk space; it also reveals properties of files and folders. Detect security breaches as and when they occur with alerts that get emailed instantly. Define threshold limits for mass access events such as malware attacks. Examine share and security permissions of files and folders and prevent access exploitation. Become proactive with real-time file and folder access and change auditing. Continuously monitor and get notified about critical activities.